In part II have we dealt with the principles. With them we arrived from the art of analysis at what we call spiritual association, the spirituality. We saw how the factor of time played a part in the relationship between master and slave: the spirit and the body. From part I we already knew that a pure consciousness is also a matter of science; a matter of seeing things as they are, of being free from illusion. If we nevertheless find ourselves in a state of illusion though, if it is so that, even though we're scientifically in order and analytically dependable engaged with the principle, we turn out not to be unified in the self of the soul, do we at that time say that we've fallen down. Some or another way have we lost our way in the fallen state and ran we into bewilderment. We then have a psychological problem, a problem of control; in the illusional state we have a so-called problem of authority or we're not pure anymore in the relation between spirit and body then, we do not know any longer who the master and who the slave would be. With problems of authority one has illusions of control: either one is paranoid on being controlled by others or one landed in the illusion that the mission of self-control would consist of the duty to control someone else. In the fallen state does one, departing from an individual illusion, together with others slide down in a common illusion of a 'society' finding itself in the chaos of the state of no longer properly cooperating people. We have no clue anymore what we're up to then, what we're supposed to do, and who we are. We so have a problem of identity, a problem with the servitude and a problem with the knowledge and are burdened with the assignment to solve that problem. Like bees whose honey was stolen by the beekeeper, we then get sugarwater, a surrogate for temporarily relieving the greatest hunger until the integrity is restored with us having a grip again on our individual and communal life. The problem of identity we solve provisionally with ego-ambitions: better to keep up appearances with an I-prophesy than give it up all together. We likewise solve the problem of servitude as well by laboring for the money, even though we, with an indefinable and uneasy feeling of estrangement, have our heart no longer to it. It's a big lie that self-interest not so precise with the rules, but O.K. And the problem of knowledge we solve by reading out aloud sermons with or without the help of 'thought-protheses' or books. Also fine, all that pedantry of 'sir minister'. No longer seeing it as clearly, no longer being as conversant, one uses spectacles, one uses 'mentures' or a 'thought-prothesis', a book. That book also is but an artificial, not really to the here-and-now adapted, fixation, but just as with the glasses that have a fixed lens-focus, is one satisfied with one's favorite author or holy scripture for that matter. Thus received e.g. the controversial novel Catcher in the Rye of J.D. Salinger (born 1919) from 1951, a cult-status for being the support and refuge for loners and dropouts who lost it with the lies of bourgeois materialism. The book shows, in the struggle for adulthood of the leading character Holden, the world of the 'phonies', the fake-people or the hypocrites, but of course is the book itself also but a fake-idea and factually thus caught in a projection. With books holier the advise is then 'judge not' or is it like Vyâsa says (in S.B. 11.28: 1): 'be free from praise and criticism with regard to someone else's actions'. All those before mentioned cases of temporary solutions we call the compensations of a failed identity, a failed servitude and a failed integrity of knowing. If we don't want to get sick of it, do we, in order to remedy that, in fact consequently have to reason back to the point where it went wrong, were we came to a fall, but do we thereupon see our way blocked by a couple of psychological mechanisms. One apparently came to a fall, but one has to keep one's faith in oneself and so one made it a life of justifying the fall-down and is one not just as easily capable any more to figure out on one's own accord what exactly the fall down or the rising to one's feet would be. Something has disappeared into the 'unconscious'. And even though one so now and then sees some half of the truth in one's sleep or in an upsurge of intelligence, one very quickly, like being one's own enemy, then pushes that away again. For it's not possible to say to yourself all the time that you're wrong, or were wrong at all even, and that you'd be at odds or not good-willing. Those who do engage in telling that themselves without a further plan, find themselves in the grip of a so-called depression: they cannot retrieve their self-esteem and motivation anymore for they are overwhelmed by the contrary of a closet full of things tucked away that all at once, in a crisis, fell over them and crushed their self-respect. Thus are we in our normal waking state 'consonant with ourselves' as the psychologists call it (viz. the social psychologist Leon Festinger 1919-1989), and are we our best friend as we already saw in the Small Philosophy of Association, and do we rather distrust the other than ourselves with the notion: 'when I'm not able to get on top of things, then you for sure neither - but if you act as if you would then I for sure are better off in facing the problem' - even though I'm just as well down in the dark then. Thus there's never an end to the psychological complexes and together we so go downhill when we as 'friends of ourselves' do not manage to know the compensations, to cut with them, as we already saw, and then get out of it all together with a better order of time being more grounded in the discipline. To keep our health we have to escape the temporary provision of compensations, that bad system that separated time from place and reduced it all to a linear rut and thus disturbed our dynamical feeling of life of being connected with the planet and with each other. With one's looking for solutions arriving at the compensations of the ego, the labor and the books, we also get into trouble with the person. The other may physically not rule us over, that we have to do ourselves. That we remembered from our education: we have to be grown up and take our responsibility. Your daddy and mom aren't there any longer and you even rejoice in it. But by making yourself the authority will the other not just like that be appreciative of or subservient to that ego, for the other person knows that game of compensations very well himself. We do not without a problem expect the other to be holy in following the principles and thus one assumes that everyone must be compensating, for that's something normal. The division stays and despair dominates one's life-experience, for one carries water to the sea with it: nothing is won with a (notion of a) charade, there's no real progress then. For the materially motivated ego of outer appearances existing there for it's own sake is not the solution really. And that's also true for paid labor and books. If one does one's job for the money only, one is not really dependable and books most of the time are a lot of grousing with a glaze of a partly self-invented world from which one also has to wake up again to discover that, even though one might dream, one in reality is still implacably the slave of the circumstances and the senses thereto, in stead of being the master of one's fate. And thus we are what the british psychiatrist R. D. Laing (1927-1989) in the sixties called the, circumstantially created, divided self of the man who outside is a fool victimized by the compensation culture with all her fake appearances and conflicting psychology, but at the inside is a god full of ideals and qualities opposed to that with a certain frustration over the inability to realize oneself, to prove oneself. This section deals with the restoration of that respect for the person that one in one's full glory is at the inside, about the cure, the becoming, which the psychologist Carl Rogers (1902-1987) in 1974 called 'becoming a person'. It's about the emphatically approached person who consequently is able to get back on his feet again with the realization of what actually the fallen state would be, what exactly at the moment would be his flaws of reasoning, his errors, his confusion on norms, standards and needs, and what his foolishness would be. But it is also about the person not so much of compensation, the person who is of God or who is a god himself and who constitutes an ideal, is the redeemer, the great leader, the savior, the spiritual master, the hero and the great beacon, the example, the source of wisdom and the control over the universe in the flesh. The latter is inevitable: desiring respect for the person one is oneself, will the other person also have to be respected, if one wants to put an end to the discord of the material ego-interest. The at first instance, more or less being infatuated, realizing of the inequality with a high - or sometimes too high - opinion of that other person in the form of a Great Personality, is there because of the karmic reaction of tipping over to the other extreme of having respect, for the control of the equilibrium wasn't there without a problem. As a child one realized oneself maybe one's father, as an adult that continues with the ideal of a godhead who also carries the name of the Father then. And for not a few consists the problem of selfrealization of the fact that indeed Great Personalities do exist, whether still around or not anymore, to look up to and to learn from. To rid oneself of the inequality is there, also according the Great Personalities, the need of a process of emancipation, a process of becoming equal, a process of spiritual growth, a therapeutic process. Out of fear for the false ego of the man of appearances and lies, do we therewith following speak of the holiness that's supposed to be free from it and of which we hope it is not sanctimonious like it is with e.g. priests violating kids, popes who ordain the death of others, sect leaders driving for suicide and spiritual leaders out for their own material advantage. We so speak of belief: in the fallen state it is difficult to believe and has one a problem of authority, but back on one's feet one all of a sudden recognizes an ally in that example that offers support and so is thus finding faith in a leader, a Lord, a therapist and/or a guru the way out of the fallen state. And that's not only true for the holiness, no, an artist honestly capable of grousing at all the sanctimoniousness is preferred over the obedient citizen who wasn't quite as capable of being artful with that less wanted presentation of the truth. Sometimes is the interest of the ideal overruled by the interest of it's manifestation. And that can be a shocking discovery with the example of therapists ending in bed with their clients or gurus who almost incomprehensibly take over your sexual karma and the rest of it. 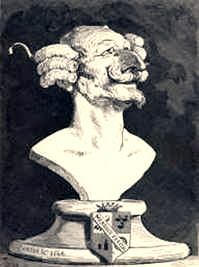 With the negation or recognition of the other in the struggle for getting attention for one's own person is it as with the legendary Baron Munchausen who pulled himself by his own hairs out of the swamp: once one in faith has been converted to the positive confession, has one to realize a position of being liberated, viz to serve the cause, if one wants to escape one's swamp. That other person one eventually is oneself and who does manage to keep to the soul, serve the cause and know his trade, must be clear in the eye of one's mind. The dutch psychologist J. J. van der Werff spoke in 1965 of self-image and self-ideal in his book with the same name: it concerns a division without which a human being paradoxically can't be happy or even be healthy and sane. One is necessarily divided being honest about the fact that one inescapably as a person is of limitations, faults, errors, misperceptions, and miseries in one's material life at the one hand, while at the other one has to counterbalance with a self more durably happy, more capable and of less faults and errors. The way we from part one to part two arrived from a person free from illusion that is one with the universe at a person identified with the matter of not being so sure anymore of the oneness with the realization of the good and bad of having principles, do we from that innerly divided, analytically and spiritually seeking man arrive at the ideal man we must manage to realize, we must put faith in as an ever on our approach receding horizon of qualities and integrity who we within ourselves have to realize as someone knowing his trade (vedically: is the caittya-guru). And thus do we, from the personal realization of our inability, arrive at the problems of religion and politics. The religion is the social organization of the respect for the ideal person in the context of a certain order of time, and the political constitutes the actuality of the problematic, but necessary respect for also the maybe not always as holy person, in which one is engaged in telling each other what actually should be the order of time in 'reality', how late it 'really' is and how the book of law 'actually' should look like. What would now be the priority of the needs of the necessary succession of deeds - like the humanist and psychologist A. Maslow (1908-1970) put it - once we at the one hand religiously know of the Original Person while we in terms of behavioral science at the other hand have accepted as being inevitable - with or without a so-called peak-experience of being on our way - what the ideal is of that person who in India is called the purusha? How to tell each other how late it is, or what we're up to, with the religion and with the politics? Or .... was it, as we already saw in part I and II, more a matter of self-control and sense of reality, that identifying ourselves with the great example of self-control of the Controller of Yoga, who in case of proven wisdom and recognizable incarnation vedically also is given the honorary title of yogis'vara? takes He everything to it's destination. to all who do not fulfill the divine law. In the search for the self of durable happiness and knowledge we so cannot escape the person, nor the necessity to respect that person, that one is oneself as well, also in a material sense. Therefore splits, filognostically, the respect for the person itself up in a personal/religious and a political/futurological section. With the personal do we in our scientifically founded, methodical selfrealization wrestle with the holiness and the authentic experience of the 'Absolute Truth', and concerned with the material interest do we wrestle with the politics of time-systems, identities, commentaries, the authority, the last word, the advantage of doubt, the law, the economy, the responsibility and the future, that we as adults to it, as we just saw, with the necessity of a certain self-ideal, also need. From part one we already knew to make for a good division in accord with the order of nature, an order which, lawful as it is, provides certainty, offers the certain knowledge that cannot be doubted by anyone. On the basis of this certainty we in part two arrived at the bold venture of learning the art to live with the duality inherent to the analytical and with the qualities inherent to the spiritual self we cannot live without either with the philosophy of liberation. Now, having arrived at the interest of the person, are we faced with the question that is classical: 'who am I?'. Vedically the answer is simply 'soham' which literally means 'I myself'. One also says 'tat tvam asi' or 'that thou art' to indicate that the reality of the I contains a relation with the reality and the principle (tat) of the universe comprising the other. Without that relation carries the I-awareness with God no reality. The I without the other is, considering the inevitability of the duality, an illusion of separateness that must be overcome with what vedically is called karuna, dayâ, bhâva or prema: kindness, compassion, affection and love. From Plato we in the West learned also that God, or better stated the way to God, must be considered the good which with Vyâsa is called sattva or the mode (guna) of goodness (S.B. 7.15: 25). 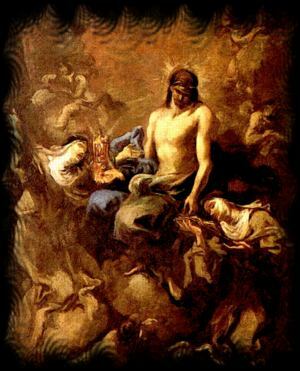 Sinful acting is thus seen nothing but the acting which, causing sorrow and grief, goes against the goodness, and serving God is the consequence of devoting oneself to this realization of the I that then no longer is called false but is called a soul, a conscientious self of principles, of norms and standards. As for the concept of God says Aristotle in About the Cosmos: 'God is one, but with many names, derived from all phenomena he time and again brings about, he is addressed ' .... he is called the son of kronos and the Time (Chronos), because his existence continues from the one endless eon on earth to the other; ...I also dare say that 'Necessity' is but another name for him, since he is the invincible cause.' The discovery of this True Self of the soul of this Original Person, who thus according the greek root of philosophy is also identified with the concept of time and necessity, can, via the mode of goodness not take place but along the ways of having respect for the other who we, with ourselves included, may not cause any grief. The ego in his falsehood poises itself against the negativity about all the rest that needs to be excluded for the sake of material action, we saw in the NOT-paradigm of part I. That negation, that denial of saying no, is essential for one's material action. It can't be otherwise. For the practice of Christianity we in Europe thus at the end of the Middle Ages knew, with this saying in mind, Martin Luther (1483-1546) who exposed the fallen state of the fundamentalistic-dictatorial influence of the Catholic Church. Result of his heroism was that the church after due centuries of struggling on was dethroned from that position of absolute power and had to learn, just like any other possible form of class-corruption, neatly and modestly to settle for a normal position in the fields of action of the individual citizen as discussed in part I. Christianity was at the end of the Middle Ages no longer the same Christianity, but had collapsed into a theology divided in itself, a factually fallen culture that later on difficulty facing the lesson of the philosophy of Enlightenment as a lecture in adulthood and (also religious) self-responsibility. Pope Gregory's calendar-reform shortly after the Middle Ages 1582 wouldn't be of much avail against that confusion. There was more at stake than the matter of the order of time. The system in it's entirety didn't accord any longer with nature, but the reformist/contra-reformist restoring with a rule of time that respect for the reality of God's creation couldn't revoke the dividedness that had risen, despite of all the burning of heretics and breaking of idols. Like Thomas Kuhn (1922 - 1996) pointed it indirectly out in 1962 with his study about the nature of the revolutions of scientific paradigms, followed in the year zero the thought model of Christianity a revolutionary way that model of Judaism and followed Islam seven centuries later historically with the same heroism the Christian vision, whereupon next after the revival of the greco-roman culture in the Renaissance around 1650 followed the culture of Enlightenment with at least as much rebel valor. Enlightenment thrived on the eroded religious authority which in fact already since the rise of Islam with the repression of their argument of time had to face it's decay. 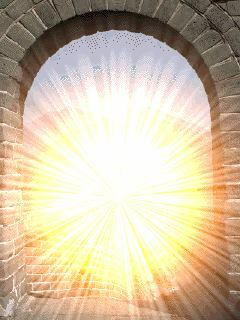 Islam had developed the praying to the position of the sun with the discovery by Mohammed (571-632) in the seventh century after Christ of that 'opportunity in de religious market' and had thus risen to success over the Christians who outside the monasteries weren't that conscientious with the order of the times of prayer. For during the Middle Ages was the julian calendar with it's kalends and ides-days there only for the monastics, for the citizens it had been abolished as early as with the roman emperor Constantine the Great (272-337). But the islamic uniformity and one-sidedness of that option was thus to the logic of the fields of human action also doomed to perish (fundamentalistically). With the philosophy of Enlightenment came not just the Church to a fall but also Islam and was she, since the historical turning-point of the siege of Vienna in 1683 where the Ottoman rule of Islam was defeated by the polish king Jan III Sobiesky (1629-1696), assigned her further as historical to be denoted use and position. The idea of enlightenment which, in a violent manner facing itself politically, in the enlightened democracy of today still finds it's expression in the motto of the European Union of 'oneness in diversity', was not an original idea of Martin Luther though, who only from a sober and self-responsible properly being versed in the scripture in a reformatory way had preached against the indulgences, and not so much had aimed at a diversity of religious and scientific practices. Also for him there was but one Lord. The notion of oneness in diversity in the enlightened multicultural sense we find back, these days politically with the modern rise of the spirit of democracy, with another religious reformer of the period: the vaishnava saint and avatâra S'rî Caitanya Mahâprabhu (1486-1543), who with that motto in India had attacked the false authority of as well the also there dominating rule of Islam, the dry theology of books and the caste-system. He was the factual Lord of that notion of enlightenment and it was He who put forward as being the most important Bible in that theology the S'rîmad Bhâgavatam or the Bhâgavata Purâna as being the one essential story of the person of God as being the Fortunate One, which had flowed from the hand of our filognostic philosopher of duty Vyâsa. Even though Luther defended a principle of religious purification, still was his ego-motivated effort for a Bible readable to each, the not cherishing of any celibate preference and not selling of indulgences any longer, a material effort. The principle of the spiritual union of the church founded on the, in fact gnostic, sanctity and sainthood, which one indeed rarely finds with normal and also clerical mortals, was dropped by him as being impure. And that made his action material. He was of no mercy with the material digression of the unholy fathers of the church, but was with the neglect of the sanctity of the spiritual union himself a materialist also; or, as the guru Osho it in so many words explained to his 'new men': 'the one saying no is not free from it yet'. With Luther we can observe how fundamentalism - see also the page about the fields with part one - itself is also a form of materialism: in pushing itself off against the more moderate, political 'materialistic' people of compromise and with the exclusion and even killing of alleged sinners do they, just as catholic contrareform itself also again did, make for a false ego not really willing to be of sacrifice for the needed reconciliation. Religious fanaticism is there of a lack of philosophy so explained one day Swami A.C. Bhaktivedanta Prabhupâda (1896-1977), the leader of the Hare Krishna's to them, one day sighing about the reprove at their address of being sectarian. And too much of philosophy gives one the dry, loveless books-estrangement of the scientists, he added thereto. Therewith seemed also of the sanctity the austerity in celibacy, that is not just respected by the catholic orders, but also, together with the analysis, the penance and the yoga is respected in India as a holy principle of spiritual knowledge, altogether false with the fall of catholic Rome. Martin Luther though being a hero, was not a saint in this sense. He had, be it with some difficulty and noble protection, like a Jesus not to carry the cross of violence of the Reformation which indeed had to be carried by the monasterial celibates who were persecuted here and there, whether they were corrupt or not. 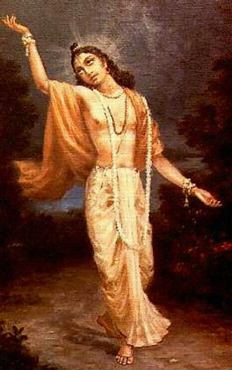 In fact was that cross in that period of spiritual confusion about the norms and standards on the shoulders of Lord Caitanya, who with his grace for the karma of philosophical scholarship and religious sanctimoniousness also for real sacrificed his sane mind (and before that his marriage) and thus for that matter may be considered the Christ of it. Luther married, not sacrificing his sane mind for the sake of his devotion to God, simply modestly and in solidarity with the common man, with a by the populace from her convent banished nun. With him, and the rest of the thus reacting Christians - as for the mob follows the leader - flared up in that thus found material self-interest of a simple, but sacramentally also commendable and not unholy, desire for offspring, a political struggle in the period that would fuel many wars more on the way to what we now, in search for the factual authority of reform and the notion of enlightenment, call the ideal of democracy. Fine, so be it, Luther we thus mustn't hold responsible for the dissension of the Reformation opposing the Contrareformation, and so he didn't think of it himself either. Of course may only the Lord himself reform His own religion and not just a human being with material needs like Luther who was but the immediate cause. From Luther we may learn that normal karmic persons cannot exist in the spirit only, but also have to carry a material burden with the democratic notion of the equality of being one in diversity; a notion which thus with Vyâsa in the Bhagavad Gîtâ already thousands of years before was called ekatvena prithaktvena bahuda and with Caitanya anew was preached as the end conclusion that says acintya bhedâbheda tattva: an inscrutable reality of oneness in diversity. The personal part of our filognosy thus commences with the individual story of this writer. Not that my small I-ness would be that important, but because my person knows the history which illustrates this development of being attached to the good, towards the being detached in the goodness which is so essential to the progress of escaping from the prison and the hopeless stupidity of civil attachments. For the question at hand is here: how in God's name does one get as far as, e.g., a Christian to occupy oneself with Hinduism, the inevitable cultural consequence of respecting Vyâsa? What exactly was the need thereof, how does such a life-experience build up? Of course am I personally but one of the many examples of people who, lost in modern time, had to reconsider things for themselves with the notion that the classical order of christian society is not quite fully of understanding and prepared to welcome someone with all the twists of our modern fate. The order of the world is the order of the world and Christianity, like Judaism and Islam is but a historical part of it, however indispensable they on themselves are for so many. And so met the writer of this in his life, departing from the christian cross, with other cultures of the sun, moon, order and gnosis, who contributed in the love for the knowledge which in the end amounted to the filognosy of this site. The ongoing realization with this was that repressive progress, the evolution at the cost of previous developments, constitutes no real progress. A tree is healthy together with its roots and so is our political, democratic and postmodern, enlightenment healthy with the vedic root, even though it is, like the Gîtâ (15: 1-4) puts it, a tree up side down that with it's roots touches the sky, and with which one has to break in the end when the jog is done and the tools may be cleared away. One gains experience all together and everything else that is found with it simply complicates the matter. The fact that there are material improvements taking place as e.g. the tape-recorder finding digital recording technologies or of the phone evolving into the communication over the internet, doesn't mean that that culture or school of learning of the medium that historically preceded another institute of civilization wouldn't be of any use anymore or wouldn't have a right to exist any longer. The vinyl-record is still around, despite of CD's and also is the radio still there despite of the t.v. Despite of the internet are there still books and despite of Christianity is there still Judaism too, just like the culture is still around of the 'sons of God' who arriving from beyond the mountains - possibly the far east thus - exerted their influence upon the Jews, like the Bible-book Genesis describes it in the chapter on the Ancient Times. So too do we later on in the political section arrive at the conclusion that with respect for a certain history of the norms and standards we simply have to count with the different views there are in the world and that we so also have to count with the different personalities, divine or not, like they are taken together filognostically at this site (and in the book thereof) with the different sections mentioning them. In fact is only non-repressively operating the respect found for the human rights and a proper idea of emancipation in de direction of the beatitude, and so is it safe to say that only with a syncretic approach, a kind of filognosy as expounded here, a realistic respect for the person and his association and a politics of mutual commenting is possible that offers a future to all. The repression that was born from a lack of talent leads corrupting to dictatorship, but the filognosy that leads to respect for all the different views leads, as was described already in the Small Philosophy of Association, to the balance of a true democracy, to a more at the human identity of the soul directed representative democracy which no longer defeats itself, just like a couple of football-teams all the time do, with a new option of sovereignty with every election. First of all is it with this outlook thus of importance to offer my own story as an example and as a proof of the viability and necessity of the filognosy for each. Even though not everyone shares the same - and thus better to recognize - experience or evolution in life, even though there are many roads that lead to the same political Rome of the actual respect for the person, still is every path traveled a gate to the future to the disposition of each. That is the proven use of a self-description one just as well may consider a failure of the dominance of the false ego as a success in selfrealization in the interest of the greater soul of the world population in it's entirety and God with all living creatures and universes to it in particular. To begin with myself are there two pages with sayings. First a page with quotes of people other than me, the way I happened to find them left and right about in particular the subject of time and the order of wisdom. Like the aphorisms on the next page that came to me as separate ideas, must they, not always wise or even hilarious as they are at times, not all be taken as serious. The page with my own sayings is called the Gray Page for that reason. They are partly absurd thoughts, impulses or emotional expressions sometimes just meant for fun or to serve another emotional reason. After having presented myself on a next page in the section called The Mirror of Tim' where I tell the story of how I arrived at my filognostical sense of order, is there room for a page on which I further deliberate on gurus and therapists and focus on the special incarnations of God in the present age. Next follows a page about the idea of time realized religiously, the way one sees it with the different world religions, and is there as an introduction to next section a page about my personal struggle with the times of the modern political quarrel. What follows next is a page specifically about the Game of Order, a complete site in itself, that everybody has to learn to play if he wants to consider himself a winner and an committed person - as far as I am concerned a filognostic. At last is there a page about the basis of vedic knowledge on which this entire site actually was built. It's beyond the scope of this site to deal extensively with the complete of the vedantic commentary written by Vyâsa, but with a general introduction to that flute in the hands of Krishna, his hero and Lordship, and the discussion of a couple of elementary chapters and nuclear verses which especially emphasize the connection between the order of time and the person of God, will religiously committed this section be completed. 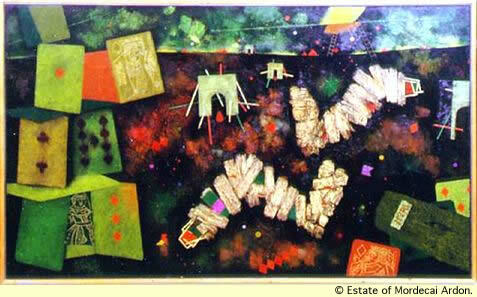 - The modern painting is of Mordecai Ardon and is called 'For the fallen souls'; it is the center piece called the 'Card house' from a triptych of 1955 - '56. It is painted in oil on canvas and is part of the collection of the Stedelijk Museum in Amsterdam. - The picture with the glasses and the book indicates to what extend a book equals a pair of glasses, works like spectacles. 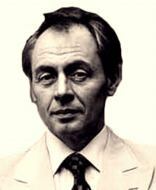 - The man underneath is the anti-psychiatrist R. D. Laing, from the sixties who emphasized the environmental factors of the societal system as possible maddeners. 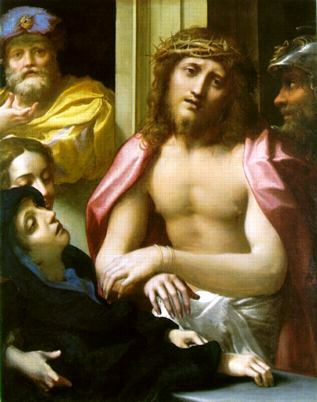 - The picture of Christ is a painting of Antonio da Correggio (1489 - 1534) titled 'Christ presented to the people' (Ecce Homo); it is from 1525-30 and consists of oil on a panel measuring 99.7 x 80 cm, and is situated in the National Gallery of London. - The picture of the bust is an etching of Gustave Doré (1832 - 1883) and shows Baron von Münchhausen. A literary character known for his grandiose adventures. His story was also filmed by Jerry Gilliam. - The Buddha is a picture of Maha-Asta Caitya, the great teacher of inner renouncement, it is from Khara Khoto, Central Asia. It is from before 1227 from the Tangut Dynasty and can be found in the Hermitage Museum. 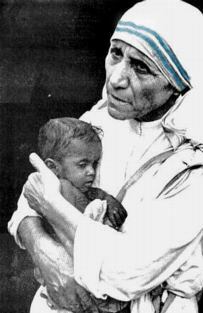 - The nun with the poor child is Mother Theresa (1910 - 1997), the holy Sister of Compassion doing her charitable work in India. - Underneath a portrait of Martin Luther (1483 - 1546), painted by Lucas Cranach der Ältere in 1529. Luther was the theologian overturned the catholic order with his struggle against the corruption of the church with her indulgences. He translated the english text from the Bible in German and thus popularized the text. 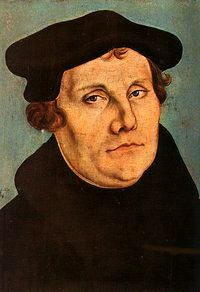 He is considered the leader of the Christian Reformation. 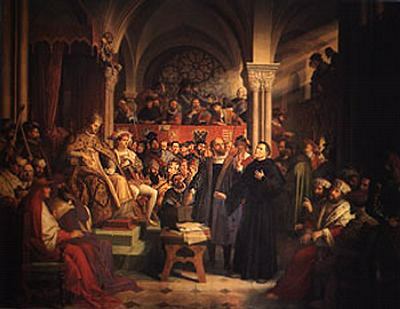 - The painting with the monk shows Luther during the defense of his theses in the reichstag in april 1521 in Worms in the presence of emperor Karel V. Luther refused to revoke anything of what he had written. - The painter with the dancer shows Lord Krishna Caitanya Mahâprabhu (1486-1543) who brought the reform of vaishnavism which contested the rule of Islam in India, the caste-system and the dry book-knowledge. His message was 'chant the names and spread the message of the Bhâgavatam'. In the West he is known as the Lord of the Hare Krishna's. - The painting of Christ with the nuns is of Alessandro Magnasco (1667-1749), and is called 'Christ Adored by Two Nuns' and is from 1715, oil on canvas, 58 x 43 cm, at home in the Galleria dell'Accademia in Venice. 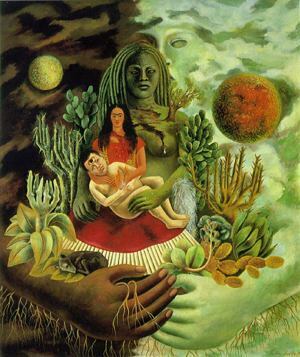 - The green painting of mother earth with her grip on the person is of Frida Kahlo and named 'The Love Embrace of the Universe, the Earth (Mexico), Me, and Senor Xolotl', and is of 1949, oil on canvas, 27 1/2 x 23 7/8 and can be found in the Collection of Jorge Contreras Chacel in Mexico City. - The picture below represents the filognostic cross in which the pranava as the form and yoga-mantra of God, the sun, the moon and the celestial sky is respected on the basis of the gnosis that mediates in the relation between science and religion. - The tree upside down is a banyan representing the knowledge of the world which roots in the heaven of transcendence. - The gate with the light opens one's eye for the still unknown but brilliant future reserved for the person of good will in the filognosy. - The hands with the flute represent the hands of Lord Krishna who bedazzles us with His love for the harmony of nature. 2: Dikè: personification of justice considered the daughter of Zeus and Themis.